Throughout the Middle East region last week, reported fatalities dropped significantly – totalling about half of what was reported at the beginning of November. This drop may be related to a dip in reported battles; however, instances of remote violence have risen at the same time. In several countries, demonstrations made up the bulk of events, mostly related to economic or political concerns. In Yemen and Syria, the battle lines have remained relatively static, while in the latter the recent peace talks in Astana have yielded uncertain results. 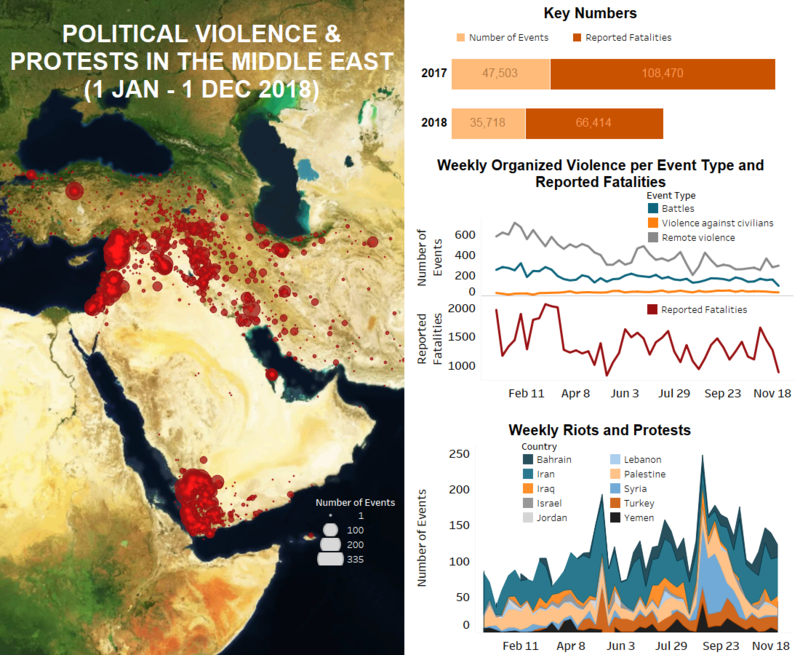 In Palestine, while demonstrations have continued throughout Gaza, it was in the West Bank where the majority of conflict activity occurred last week. These took the form of “price tag” attacks – acts of violence and vandalism by Israeli settlers targeting Palestinians – home demolitions, and demonstrations. In East Jerusalem, police suppressed a protest by locals against the 25 November arrest of the city’s Palestinian governor Adnan Gheith. He was arrested following an investigation into his involvement with the Palestinian Authority’s (PA) arrest of US citizen Issam Akel in October (Al Jazeera, 2 December 2018). In Israel, there were a number of demonstrations in Jerusalem, Lod, and Tel Aviv against a variety of issues, including the Cultural Loyalty Bill, conscription of Haredi Jews, and violence against women – the latter as part of the International Day for the Elimination of Violence against Women. Similarly, in the Jordanian capital of Amman, taxi drivers continued to protest against the rising popularity of ride-sharing apps, while there were also demonstrations against the government’s tax and legal policies. In Lebanon, armed disputes between members of several groups occurred in the country’s largest Palestinian refugee camp, Ein el Hilweh. While there were no fatalities reported, a civilian bystander was seriously injured during a clash between two members of the Bilal Arqoub militia and Fatah Movement. Elsewhere, Lebanese military personnel arrested over 300 Syrian refugees during an operation in the town of Arsal, just west of the Syrian border. The majority of these arrests were reportedly made due to expired documentation, although several of those taken into custody had outstanding warrants or lacked documentation entirely. In Iraq, there was a resurgence of demonstrations in the south of the country, particularly in the oil-rich province of Basrah. Demonstrators are demanding better work and social services, as well as fixed contracts. These demands are similar to those expressed during the large surge of southern demonstrations last July, although they have yet to reach the same intensity (for more on that, see this ACLED piece). Meanwhile, there was significant Islamic State (IS) activity in the governorates of Kirkuk and Diyala, where a number of police and soldiers were reportedly killed during IS ambushes. In the north, Turkey warplanes continued to target Kurdistan Workers’ Party (PKK) militants hiding out in mountainous regions of Dahuk and Erbil governorates. Over a dozen militants were reportedly “neutralized”, meaning killed or injured. In Turkey itself, battles between the PKK and the Turkish military increased as both sides reportedly conducted operations against the other. As is typically the case, the majority of battles occurred in the southeastern provinces of Sirnak and Hakkari, while there was renewed activity in Mus province after several weeks of peace. In addition to the military activity on the ground, 620 people were reportedly arrested throughout the southeastern provinces between 20 and 27 November on the charge of working with the PKK. During the same week, 40 on-duty soldiers were detained by police in Ankara on the suspicion of being supporters of the Gulen Movement – which is officially accused of orchestrating the 2016 coup attempt. In Iran last week, dozens of labour demonstrations continued across the country; notably the mass protests by hundreds of workers of the Haft Tapeh Sugarcane Company in Shush and the National Steel Company in Ahvaz. Furthermore, on 25 November, a group of angry farmers in the village of Qarneh, Isfahan province, destroyed facilities diverting water from the provincial capital to the neighbouring Yazd province, which was followed by a clash with the police. This marks the 24th time since last March that water pipes from Isfahan to Yazd have been vandalized and disrupted (Radio Farda, 25 November 2018). Over the past decade, Iran has experienced the most severe and prolonged drought in over 30 years, with Isfahan and neighbouring provinces having been hit particularly hard (The National, 19 July 2018). The water shortage in eastern Isfahan province, which has a large rural population, has been further exacerbated since the project to transfer water to Yazd became operational, leading to an increase in farmer demonstrations. In Bahrain, several protest demonstrations were held in support of Shiite cleric Sheikh Khalid Fadhil al-Zaki – head of the Sharia Commission at the Central Committee of the now dissolved Islamic Scholars Council – who was recently arrested by police forces (Press TV, 30 November 2018). Demonstrators further called for the boycott of the second round of parliamentary elections – the first round of which was held earlier amid calls for a boycott by several groups including the main Shiite opposition group Al-Wefaq, which is now banned (for more on recent demonstrations in Bahrain, see this ACLED piece). Intense battles were also fought between anti-Houthi and Houthi fighters in the districts of Ad-Dali, Al-Bayda, and Ma’rib, with limited gains being reported by anti-Houthi forces amid reports of heavy fatalities. Meanwhile, US drones struck suspected Al-Qaeda targets in the Wald Rabi district of Al-Bayda, reportedly killing at least six. In addition, UAE-backed Shabwani Elite Forces deployed into Merkhah As Sufla district of Shabwah governorate as part of a new counter-terrorism operation. Lastly, Houthi forces fired several ballistic missiles into Saudi Arabia throughout the week, including one which hit a helicopter base in Najran district. In Syria, regime forces continued their exchange of shells and occasional clashes with rebel and Islamist factions in the Hama and Lattakia countrysides. At the same time, regime forces in the area were bolstered by an influx of reinforcements. Meanwhile, Syrian Democratic Forces (QSD) along with fighters from the Kurdish People’s Protection Units (YPG) clashed with Turkish-backed rebel factions in the northern countryside of Aleppo. There were no reports of Turkish shelling, as was the case the previous week. In Deir-ez-Zor governorate, clashes between IS militants and QSD fighters – supported by their Global Coalition allies – continued in the Hajin enclave for another week. No territorial gains were reported by either side. Finally, on 28 November, representatives from Turkey, Russia, and Iran met once again in Astana to try and hammer out a peace deal. They discussed the general situation in Syria, however, there was a strong focus on Idleb specifically, as well as on the continued violations of the 17 September ceasefire agreement. In the latter regard, they agreed to step up their efforts to ensure observance of the agreement. The parties also reaffirmed their determination to launch the Constitutional Committee in Geneva, and to cooperate in fighting militant groups such as IS and several factions linked to Al-Qaeda (MFA Kazakhstan, 30 November 2018). This being said, since the Astana Talks concluded, regime forces have continued to shell areas within the ceasefire’s DMZ in Idleb governorate.